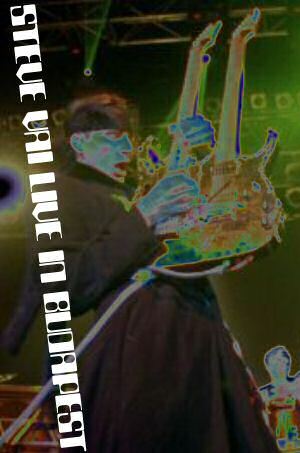 Not much more than a year after the last G3 tour of Europe [see the review of that show here] Steve Vai and his Breed came back to Budapest to the same venue, not the open air part but inside this time. The inside of the venue is known for its relatively bad acoustics so one had to be prepared for that before the show. Obviously the man at the mixing board wasn’t aware of all that and he lost his grip of the show. 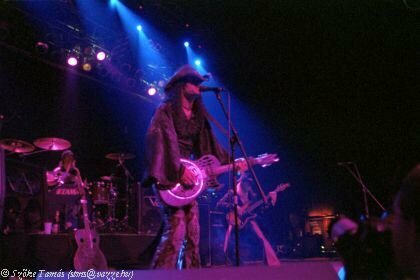 Eric Sardinas is not an easy task mixing-wise anyways as the man is using some weird dobro-like guitar spiced up with a strangely placed gain-handle that he is using almost as frequently as Vai uses the tremolo. His sound varied from a clean acoustic to a heavily overdriven bluesy hard-rock guitar sound that ended up almost always as a noise due to the poor job of the man at the mixing board. However Eric’s performance saved the gig, he and his band were energetic, charismatic, and their rootsy bluesy hard rock got the crowd’s appreciation from the first few notes he played. Not being familiar with his music I was blown away by his performance, he gave a new meaning to blues-rock with an extremely virtuoso playing. Even his vocal tracks featured riffs and licks that were tricky enough to make it as solos for the majority of the ‘classic’ blues-rock artists. The entire performance was credible with a few really cool show-gags like muting the guitar and moving like an ‘air-guitar’ player for a while, then using an open bottle of beer for sliding, shaking the contents of the bottle up on the neck of the guitar with his thumb plugging the hole of the bottle, then releasing the bubbles in a big splash along with the crash cymbal break, and such. The ‘classic’ guitar-burning part also looked credible, especially that the guitar was still hanging in Eric’s neck (!) when he set it on fire [it did look dangerous]. All in all Eric and his co played their hearts out and the crowd really got into their show although Eric was pretty much unknown here in Hungary before. 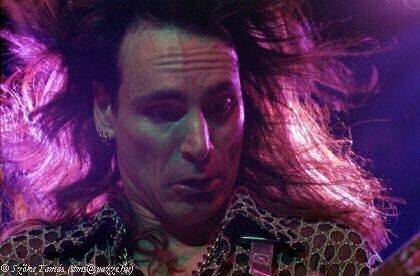 Despite the sound problems I felt the Sardinas show was gonna be difficult to top even for Steve Vai and his Breed. Yet the opening of the gig chased my doubts away as the band got on stage with an energetic opening trio of songs pulling the all-time favorite “Audience is Listening” as the second song and grasping the crowd with it right away. 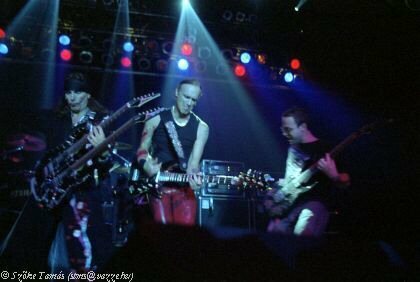 Unfortunately Tony MacAlpine’s guitar and his keyboards too got totally lost in the mix and only the strings hitting the pick-ups were audible from Billy Sheehan’s bass. 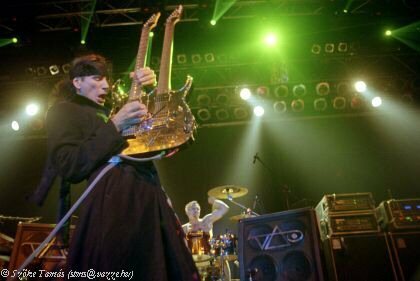 It took about 5 or 6 songs till the bass “arrived”, so did Tony’s guitar sound, sometimes even out-sounding Vai’s. 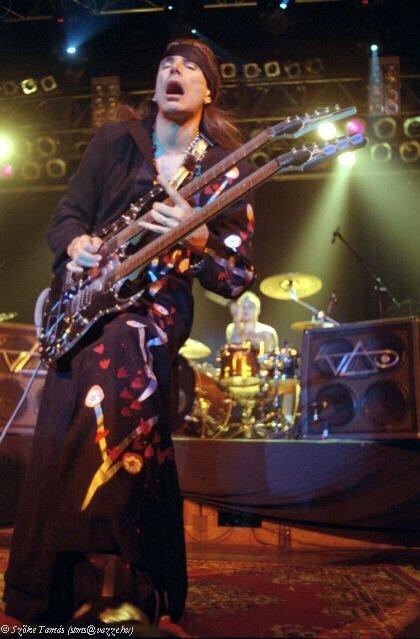 Steve was a “nice little boy again” handling the crowd with respect and enthusiasm promising they would play “5 hours more than the last time” they were here with the G3 tour. Well, they got close to keeping their promise, the show was rather satisfying with a total running time of almost 2 and a half hours. However the amount of songs played wasn’t much more than it was at the G3 show. 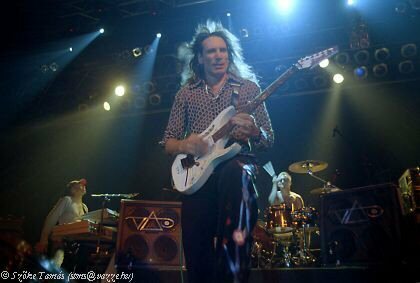 The extra hour was spent mostly by solos, a very short one for Dave Weiner with the rest of the band; a far-too-long keyboard solo from Tony which started out with a boring Vangelis-like part, went on with his usual Chopin-admiring piano part, and ended with a guitar-solo like part with lots of pitch-wheel bending (personally I’d much rather have heard something from his solo albums on the guitar and not on keys… The Raven the next time maybe?). Then there was a forgettable bass solo from Billy that had one good part in which he proved he can play really fast without the support of an electric drill but during the majority of his solo I was thinking of giving him Stig Pederson’s (D.A.D.) bass guitar… (You know that’s the one that has only two strings…) Billy proved his skills with 6 strings as well during the encore when he and Tony changed guitars and Billy got to play a short solo. The drum solo by Jeremy Colson was probably the most entertaining on its own from all the solos as he was playing half of it on a small drum kit spiced up with lots of percussive parts and went on to play his real drum-set (again: 2 minutes more than enough though). Despite the long solo parts the choice of the set-list was rather good, there weren’t too many songs from the new album, all the classics were included, there was a really good acoustic set, and there were only three vocal tracks which were more than enough if you take Steve’s limited vocal abilities into account. The only downside of the show was the endless amount of Steve’s guitar screaming without any musically accompanying which is fine for 2 minutes but towards the second hour of the show I mumbled to myself something like “Somebody should buy him a noise-gate so that he can’t do this stuff anymore….” When the Breed is playing there’s so much virtuosity and creativity squeezed into one band that your head keeps spinning around while watching the stage and listening to whatever you can get out of the usually f**ked-up mix. When Steve’s standing in the middle of the stage with his guitar screaming as high as you’d think it’s some dog-whistle, you only wish the band came back very quickly and went on with the treat you get when they are all on stage. 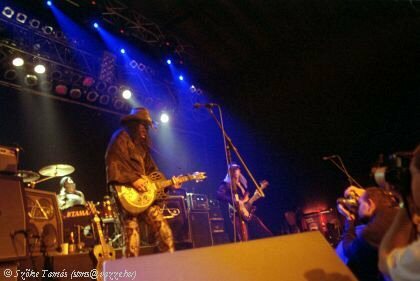 The encore gave you that treat with an okay version of “My Guitar Wants to Kill Your Mama” with Eric Sardinas joining the band (he apparently didn’t find his place on stage among the Breed); then the Breed ending the show with the compulsory “For the Love of God”. Taking the length of the show, the diversity of the set-list and the professional performances all into account I guess both guitar technique-freaks and those who appreciate music played together by great musicians found their treat. And that made it a unique experience. Make sure to check the tour out if it hits your town. Visit www.photopress.hu for more photos from the gig!